I came across some interesting social media facts and statistics that has me quite concerned about the dental hygiene levels on this planet. Facebook continues to innovate and evolve and the the last 12 months have seen the new timeline introduced to personal profiles and brand pages as well as the purchase of Instagram, the mobile photo app platform, which has never made any money and has only 13 employees for a generous price of $1 billion. This underlines two key elements that emerging as pivotal to the continuing evolution of the social web. These two factors will continue to wield sizable impact and disruption to social networks and business marketing. So what other numbers are important to take notice of when it comes to Facebook? Twitter is still the enigma of the social networking fraternity with its usefulness questioned by a lot of people. Its simplicity is still its main attraction along with its immediacy in breaking news about the latest “events”. Research shows that the main reason people retweet is due to interesting content. As it approaches its sixth birthday its revenue is slowly climbing with projections that in 2012 its income will hit $260 million. READ ALSO Is Your Social Media Measurement Strategy Sustainable and Ethical? LinkedIn started in 2003 as a professional business social network and as of February 2012, has over 150 million members according to the official press release from LinkedIn. Communication and engagement is much more than talking or writing and the popularity of YouTube is evidence of that. The availability of cost effective high speed internet access is making it easy for people to express themselves via video. Brands have seized on its power to be a viral media that augments traditional advertising media such as TV. YouTube’s advantage is it is always available and searchable. (it is the worlds second largest search engine after Google. This capability has been displayed by the success of the Old Spice marketing campaign amongst many others. Instagram on the surface appears very simple. It is an app for your mobile phone that allows you to take a photo, apply a filter to make it look awesome and then you can share it on Twitter, Facebook or to your email straight from the phone. The headline about this social network was its acquisition for $1 billion by Facebook. This was despite the fact that it hadn’t made a dollar of profit. Despite this sizable investment it could be a very strategic and savvy move by Facebook that confirms its crown as the top photo site in the world. It also reminds me of Google’s purchase of YouTube for $1.65 billion in 2006 which proved to be a great decision in hindsight. Founded in March 2010 with the initial name of “Burbn” by Kevin Systrom and Mike Kreiger with the $500,000 in seed funding. It was launched in the Apple “app” store in November of 2010. In February of 2011 they raised an additional $7 million including an investor called Jack Dorsey of Twitter fame. The release of the Android app version saw 1 million downloads in 1 day! It appears that simple ideas are sometimes the best. Twitter is a minimalist 14o character social network, Instagram is a simple social sharing photo sharing app and Pintrest is about pinning images and videos that you like to an online pin board. Maybe it is evidence of a cry for simplicity and efficiency in a time poor society. Pinterest was established in December 2009 and launched as a closed beta in March 2010. It is barely 2 years old. 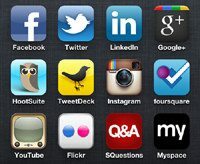 It is expected that Google’s new social network Google+ will hit 400 million users by the end of 2012. It needs to be kept in mind that Google+ is more about being “core” to Google’s social web strategy as it aims to embed social signals into its whole web and search strategy as it aims to continue to be relevant in an increasingly social and mobile web. Google makes it mandatory to join Google+ when you register for a Gmail account which really amounts to it being a forced membership. This non organic strategy means that its engagement levels are extremely low at 3 minutes per month compared to Facebook at 405 minutes, in fact they are less than MySpace. It must be also kept in mind that Google+ is the glue that connects Google’s other social and web properties such as YouTube, Android and of course search.